"Why--why--that is only a number, you know, not a name." In 1916, six years after Mark Twain's death, his biographer and literary executor Albert Bigelow Paine released a book titled THE MYSTERIOUS STRANGER, claiming it was Mark Twain's last major work. The book has now passed into public domain and remains widely available. In 1963 scholars, led by researcher John S. Tuckey, carefully examined Twain's papers and manuscripts and discovered that Paine had tampered with and patched together three previously unfinished manuscripts and with assistance from Frederick Duneka added passages not written by Mark Twain in order to complete the THE MYSTERIOUS STRANGER. Paine's volume was a literary fraud that went undetected for more than forty years. 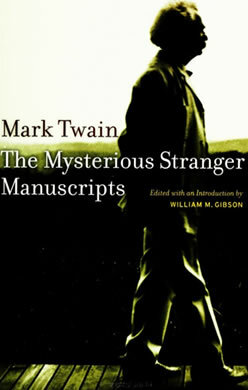 In 1969 the University of California Press published all Twain's unfinished manuscripts for the story in a scholarly edition titled MARK TWAIN'S MYSTERIOUS STRANGER MANUSCRIPTS edited by William M. Gibson. Available from amazon, this book contains all the versions of Twain's story along with his working notes. "The Chronicle of Young Satan" written between November 1897 and September 1900 and set in the fictional locale of Eseldorf, an Austrian village in 1702. "Eseldorf" is German for "assville" or "donkeytown." "Schoolhouse Hill" which was begun in November 1898 and set in St. Petersburg (Hannibal, Missouri). The name "No. 44" first appears in this manuscript. "No. 44, The Mysterious Stranger," also known as the "Print Shop" version written between 1902 and 1908 and set in Austria in 1490, not long after the invention of printing. The final version of the story NO. 44, THE MYSTERIOUS STRANGER was released in a popular edition by University of California Press in 1982. "My wonderful scholar, tell me your name." The school crowded forward in a body to devour the stranger at close quarters with their envying eyes; all except Bascom, who remained apart and sulked. Twain's working notes for the various versions of the stories are included in MARK TWAIN'S MYSTERIOUS STRANGER MANUSCRIPTS. Twain's notes for the "Schoolhouse Hill" version indicate he first considered using the number name "404" and later changed it to "94." Twain played with the numbers as revealed in his working notes when he also wrote, "I am No. 45 in New Series 986,000,000." "Number 44, New Series 864,962." "What a hell of a name!" ejaculated Hans Katzenyammer, piously. In his explanatory notes for the book, editor William Gibson conceded that Twain's number name was challenging and "it ought to mean something." But what? Over the past decades, several noted Mark Twain scholars have presented their theories as to what may have been the inspiration or meaning of Twain's number 44. In that school were the first Jews I had ever seen. It took me a good while to get over the awe of it. To my fancy they were clothed invisibly in the damp and cobwebby mold of antiquity. They carried me back to Egypt, and in imagination I moved among the Pharoahs and all the shadowy celebrities of that remote age. The name of the boys was Levin. We had a collective name for them which was the only really large and handsome witticism that was ever born on those premises. We called them Twenty-two -- and even when the joke was old and had been worn threadbare we always followed it with the explanation, to make sure that it would be understood, "Twice Leven -- twenty-two" (Smith, p. 20). Smith theorized that it was "remotely possible" Twain arrived at his early name for Satan -- No. 44 in this same manner. In his explanatory notes for MARK TWAIN'S MYSTERIOUS STRANGER MANUSCRIPTS (1969), William Gibson considers Henry Nash Smith's theory and provides evidence that Twain may have been influenced by the joke using the Levin brothers' name. Gibson cites an entry from Twain's personal notebook for June and July 1897 when Twain contemplated using the "Lev'n" boys in a new Huck Finn story, but "Instead of 11, call them 9 (Nein) and 18." I am fading, still fading. Shortly if my distress of mind continues, there may be only four of us left. (That is a joke, and it naturally takes the melancholy tint of my own feelings. I will explain it: I am Twain, which is two; my Double is Double-Twain, which is four more; four and two are six; two from six leaves four. It is very sad. 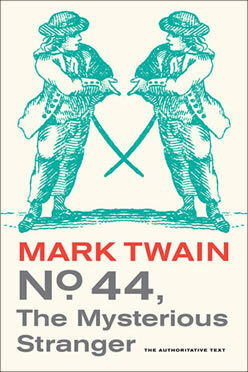 Gibson theorizes that in a "punning non-mathematical sense, 44 might be Twain twice doubled." He concedes, however, that the explanation is not adequate and the best conclusion he can offer is the one found in Twain's working notes that "Satan's original host have large families" (Gibson, p. 473). Along religious lines, there are other possibilities worth further investigation. One derives from the fact that there are twenty-two letters in the Hebrew alphabet, and the number acquires mystical significance in certain Jewish connections (as in the Sefer Yetzira, "The Book of Creation"). The number recurs at various points in the Bible; there were twenty-two kings in the Davidic line; Psalm 22 begins with Jesus' last words on the cross; and so forth. Also there are twenty-two major trumps in the tarot pack of cards, which are connected with twenty-two mystic paths.No doubt the number may have other interesting associations, the very multiplicity of which makes any single attribution merely speculative --unless there is objective evidence that Clemens took that particular association seriously (Kahn, p. 206). Kahn also suggests the figure of the "mysterious stranger" may have parallels to the legend of "The Wandering Jew." However, Kahn leaves his readers with nothing more than the various possibilities that require further study and proof. The 1982 Mark Twain Library edition of No. 44, The Mysterious Stranger published by University of Californnia Press features an introduction and explanatory notes by John S. Tuckey who suggests there is psychological significance in the number four or multiplies of four which symbolize psychic wholeness. Tuckey points to the study of C. G. Jung, Man and His Symbols (1969) as his reference. Tuckey writes, "Jung did not claim to have invented the signification of fourness, but only to have elucidated it as an abiding symbol of the whole personality" (p. 191). While Tuckey's theory amounts to only a brief mention, further examination of the symbolic nature of the number four can be found throughout the Bible as well as freemasonry. In the July-August 1989 issue of MARK TWAIN CIRCULAR, Louis J. Budd presented his theory in an article titled "Another Stab at the Origin of No. 44 as a Name." Polish poet Adam Mickiewicz's play "Dziady" (which can be translated as "Ancestors"; also subtitled "Forefathers' Eve") written between 1822-1832 contains a Polish priest who has a vision of a national hero who will be named "forty-four." Mickiewicz's "forty-four" appears in Part Three, Act One, Scene Five of the dramatic production of "Dziady." Mark Twain was in Vienna in the fall of 1897 and in frequent contact with Professor Theodore Leschetizky, a Polish teacher who taught music to Twain's daughter Clara. Budd has no proof that Leschetizky introduced Twain to the writings of Mickiewicz but points out that Twain's first use of "No. 44" as a name came no earlier than November 1898, a year after moving to Vienna. According to Budd, Polish scholars have attempted to find the source for Mickiewicz's "forty-four." Budd states one theory is that the name is "Possibly the numercial value of the letters in the Hebrew alphabet which spell out Mickiewicz's first name, Adam. A prophetic numerology typical of the Cabala" (Budd, p. 2). Budd concludes Twain did show an interest in Jewish lore during his stay in Austria, and he could have picked up forty-four as a name for a quasi-god that existed prior to the Old Testament fall of Adam and Eve. In 1995 R. Kent Rasmussen published his theory of the name Forty-four in his first edition of MARK TWAIN A TO Z (Facts on File, 1995). Rasmussen suggested that Twain may have seen it as an abbreviated form of 144, the highest number in the standard multiplication table. In a passage immediately preceding Forty-four's introduction to the teacher in the "Schoolhouse Hill" version, the class recites "up to twelve times twelve." Rasmussen also states the number 144 is suggestive because there are 12 feet, or 144 inches in two fathoms -- the nautical depth equivalent to the steamboat leadsman's measurement of "Mark Twain." [I]t is my argument that Twain created the name "August" effectually in response to the name "Forty-four" and embedded within it a significance to amplify and deepen not only the intimate correlation between the two protagonists of No. 44, The Mysterious Stranger but also the original relevance of the name "Forty-four." Philip Ashley Fanning's biography of Orion Clemens MARK TWAIN AND ORION CLEMENS (University of Alabama Press, 2003) was the first major biography of Mark Twain's brother Orion Clemens and examination of the often troubled relationship between the two brothers. The journal MARK TWAIN ANNUAL (Vol. 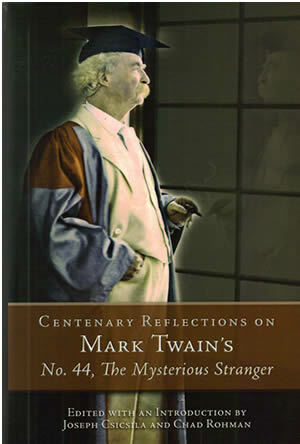 4, 2006) contains an essay by Fanning titled "Mark Twain, Orion Clemens, and the Mysterious Stranger" in which Fanning presents his theories that the various manuscripts were written at a time when Samuel Clemens was struggling to come to terms with his relationship with his older brother Orion who had died in 1897. Fanning believes Twain originally cast Orion in the role of the "Mysterious Stranger" and then later put himself in that role. Conceivable the name "44" refers to the year 1844, which could have been when Orion tried to reform the Blankenships... (Fanning, p. 132). Fanning's study of the "Mysterious Stranger" manuscripts and the parallels he found between the stories and Samuel Clemens's relationship with his brother Orion are intriguing. However, Fanning can offer no further proof regarding the origin of the name "No. 44." Diana Curtis published her theory in "Two Samuels of Hartford: Clemens, Colt, and the Unification of a Disjointed Mysterious Ending" in Studies in American Fiction, 34, no. 1 (Spring 2006), pp. 69-85. Curtis proposed that Samuel Colt's .44 caliber six-shooter, manufactured by the Hartford company Colt Patent Firearms inspired Twain's usage of a character who could be construed as either good or bad. Curtis argues that the setting of the story in the fifteenth century coincided with the development of the matchlock, a small firearm that could be held by a single person. The firearm was revolutionary, in much the same way as Samuel Colt's .44 caliber six-shooter was in the nineteenth century. Curtis emphatically declares, "Twain's decision to name his title character No. 44 cannot have been coincidental." Bolstering her argument, Curtis points out that Twain's decision to use the number 44 as his character's name is indicated on working notes dated November 17, 1898 -- the same day Twain wrote to inventor Nikola Tesla who was involved in the development of superior destructive weaponry. Curtis also points out that Twain's working notes indicate he planned to have No. 44 fall in love with his character named Hellfire Hotchkiss. The Hotchkiss mountain gun was at that time being used in the Philippine-American War. Curtis makes a strong argument that weapons and weaponry were on Twain's mind when he came up with the name No. 44. In his article "Mark Twain's Last Cakewalk: Racialized Performance in No. 44, The Mysterious Stranger," in American Literary Realism, Spring 2008, pp. 262-271, Henry Wonham commented on the multiple identies represented by No. 44. "44 punctuates the novel with appearances as a break-dancer, a cakewalker, and a minstrel type" and thereby "upsets our own assumptions about the simple differentiability of an essential self from its manifold representations ... the original self and its burlesque representation have become entangled, conjoined." (p. 269). Wonham explains "Theories abound as to the significance of 44's name. It seems plausible to suggest one more, namely that the novel's minstrel imagery struck Twain as a thematically apt corollary to the interchangeable numerals 4 and 4 (p. 271). David F. Nolan, an alumni of Massachusetts Institute of Technology writes that in some cultures, calling a person "number 44" is an insult, based on the belief that one person in 44 falls outside the norm. This corresponds to the fact that in a normal Gaussian (bell curve) distribution, 1/44 of a population falls outside the two-sigma point on the curve. The Gaussian theory of distribution was developed by Johann Carl Friedrich Gauss (1777 - 1855), a German mathematician who applied it to theories of astronomy, a field in which Mark Twain was deelply interested. Nolan writes, "I first heard the phrase 'you number 44' in my student days at MIT; I don't think it referred to Twain's story in any way." Centenary Reflections on Mark Twain's No. 44, The Mysterious Stranger. The meaning of "No. 44" and the significance it held for Mark Twain remains a mystery. Scholars who continue to study the manuscripts will likely feel compelled to try and answer the question. Budd, Louis J. "Another Stab at the Origin of No. 44 as a Name," Mark Twain Circular, July-August 1989. Fanning, Philip Ashley. ""Mark Twain, Orion Clemens, and the Mysterious Stranger," The Mark Twain Annual 2006, Vol. 4 (Mark Twain Circle, 2007). Gibson, William M. (ed.). Mark Twain's Mysterious Stranger Manuscripts (University of California Press, 1969). Kahn, Sholom J. Mark Twain's Mysterious Stranger: A Study of the Manuscript Texts (University of Missouri Press, 1978). Nolan, David F. Personal correspondence, 9 April 2010. Rasmussen, R. Kent. Mark Twain A to Z (Facts on File, 1995). Smith, Henry Nash. "Mark Twain's Images of Hannibal." Texas Studies in English, Vol. XXXVII (University of Texas Press, 1958).